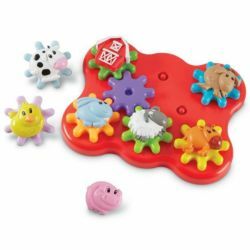 Chunky spinning gears help toddlers develop fine motor skills, while a smiling sheep, goat, pig, and other farm animals spark imaginative play. Set includes 8 large gears, 7 friendly characters, 1 farm knob, and 1 portable base. Infant-Toddler.